Become visible in a magical, appealing and connective way. LUNATIVE ELECTRIC APPAREL revolutionizes functional clothing in a spectacular way. You are creative and inspiring? You are working with the magic of light? Join our mission! 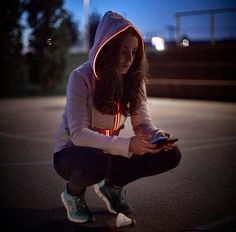 Buy one of the worldwide first LUANTIVE FLASH HOODIES with Active Ambient Light – first of all and exclusively!